In town for the Lakers matchup with the Heat tonight, Kobe took in last night's Duke vs. Miami game in a new colorway of his ninth signature shoe. After not seeing any new versions of the Nike Kobe 9 Elite since it's launch back in early December, we've now seen two new colorways in the past day. The first was a Neo Turquoise/Volt edition seen yesterday. 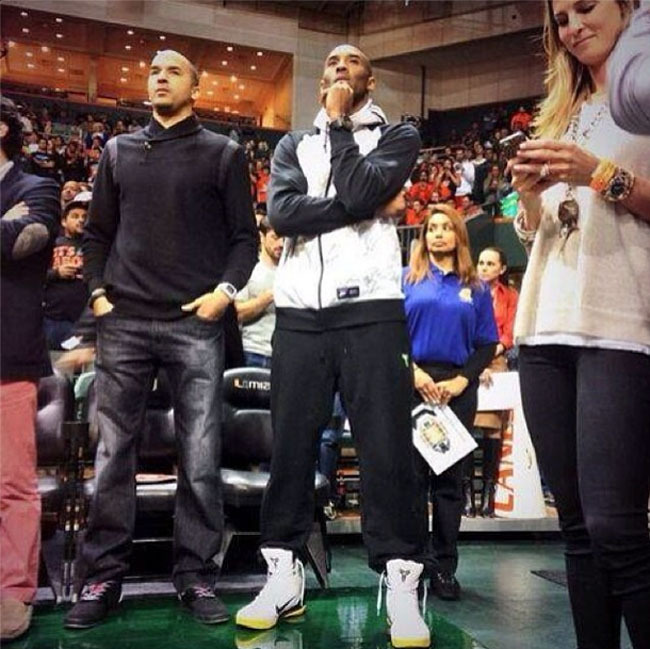 Then, last night, Kobe himself was spotted in another. In town for the Lakers matchup with the Heat tonight, Kobe took in last night's Duke vs. Miami game, where he played to the hometown crowd by throwing up the "U." And he did so in a colorway of the Kobe 9 Elite that looks like it would go perfectly with the Lakers' Sunday best, thanks to its predominantly white upper, and yellow trim along the sole. Let us know your thoughts on this new colorway, and how long you think Kobe has been a fan of "The U."